We were supposed to start this one together last Friday, but my day job got in the way of those plans as I ended up having to work. We did work on this project a bit last weekend, but not like we like to, which is all day, uninterrupted. I am planning to work on more blocks to put towards this project today – between the regular domestic chores that compete for my time each weekend – laundry, grocery shopping, cleaning house, etc. This is a picture of the progress that I have made so far – 10 of the 50 blocks required to make this a queen size. I was originally going to make this one lap size, but I have enough fabrics in my stash to make more blocks so why not go for it, and make the queen size, right? This project sort of counts as a patriotic project. If you double click on the picture, you should be able to see the Canadian flags in the bouquets on the border print. Canadians are a bit quiet and subdued about putting their flag out there front and center. When I bought this fabric more than 3 years ago, I wanted to make a patriotic quilt and I was unable to find any fabric with the Canadian flag on it. Of course, in the last year, that has all changed with the focus we had last winter on the Winter Olympics. Now I am seeing Canadian flag fabric everywhere! I am starting to see the July 4th Independence Day quilts show up on American bloggers’ pages. I decided to make my own Canadian patriotic quilt to commemorate Canada Day. 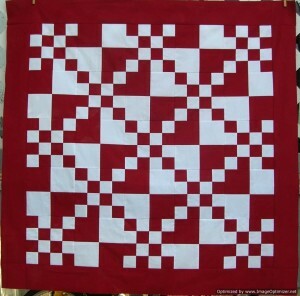 Our flag is red and white and so Mary’s Easy Double 4 Patch pattern seemed to fit the bill. I started this quilt last night and finished it off today. I cut Mary’s pattern down to 48 1/2″ square. If you want to make Mary’s quilt in the same size as mine (5 blocks x 5 blocks), the following are the number and size of each strip to cut. For 12 four patch units: Cut 3 strips – 4 1/2″ wide from colour A and 3 strips – 4 1/2″ wide from colour B. For the border: Cut 5 strips 4 1/2″ wide. For the binding: Cut 5 strips 2 1/2″ wide. Building a Better World… One Square at a Time.